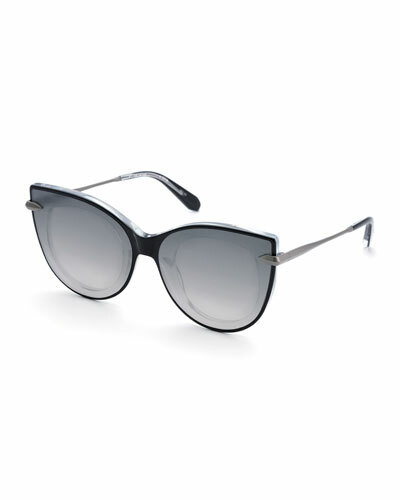 Garrett Leight "Linnie" aviator sunglasses with signature, removable clip-on lenses. Lens/bridge/temple (in mm): 51-18-145. Monochromatic, CR-39® lenses. Windsor rims; cured cellulose acetate temples. Metal double-stripe detail wraps hinges at temples. Stainless steel frames. Double keyhole nose bridge. 100% UVA/UVB protection. Imported. 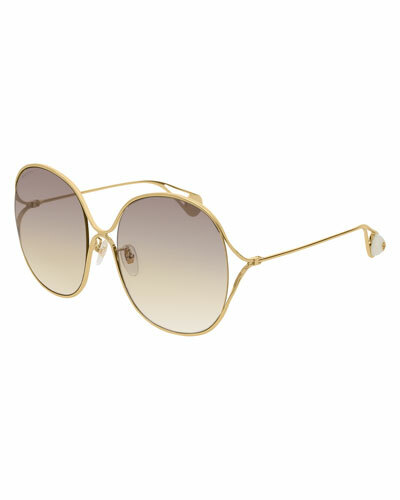 Marc Jacobs aviator sunglasses. Metal frames. Gradient lenses. Double nose bridge; curved brow bar. Logo-embossed temples. Acetate arms. 100% UVA/UVB protection. Made in Italy. Proposition 65 WARNING: Sunglasses contain bisphenol A (BPA), a chemical known to the State of California to cause birth defects or other reproductive harm.